Spring is alive in the Puget Sound! Soft, green sprouts of infant saplings are pushing their way through the damp soil, and round buds wait to explode in a firework display of colorful blossoms and new leaves. A myriad of birds gather around the feeders we hang in our yards, and chipmunks and squirrels dash about to collect forgotten seeds in their bulging cheeks. In the waters of Puget Sound, orcas are teaching their new babies how to swim and hunt with their pod, sea stars are repopulating and munching on plump shellfish, and hosts of phytoplankton welcome the sunshine. New life is apparent everywhere you look! Studies have shown that increased time spent outside has a positive correlation with elevated health. In fact, an article published by the Harvard Medical School reported a few very important health benefits associated with spending time outside. Allowing your body to soak up the sunshine cannot only increase the use of vitamin D (which strengthens your bones, by the way), but increased exposure to natural sunlight can also leave you feeling happier. In addition, exploring nature also increases your time spent exercising, which has a number of health benefits, including better cardiovascular health. The University of Essex in England’s Green Exercise program has also found evidence suggesting that exercising in the great outdoors can increase self-esteem and decrease overall fatigue and stress. Fortunately, our location in the Pacific Northwest is ripe with opportunities to stay healthy by enjoying nature. Not only do we have access to spectacular mountain ranges and thick rainforests, beaches and estuaries are just a skip and a hop away! Because these spectacular natural resources are so beneficial to our health and vitality of our local ecosystems, many organizations have made it their mission to protect and educate about the wonders we have right here in our backyards. Make-up volunteer training with Harbor WildWatch is just a few days away. Join the HWW team on June 13 to learn about how you can be involved. For more information, visit harborwildwatch.org. Harbor WildWatch, one such organization based out of Gig Harbor, has been training volunteers for years. As a volunteer with this hands-on nonprofit, you not only have the opportunity to learn about the incredible creatures and systems that make up our local marine environment, but you also get to teach the public about how to be a good steward of our natural resources. 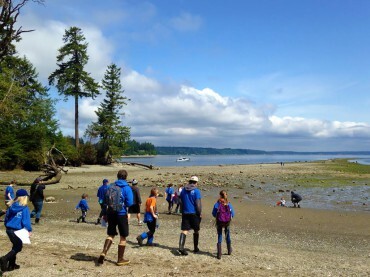 From beach walks and touch tank programs, to salmon spawning and planting parties, opportunities to breathe fresh air, explore under beach rocks and get your hands in Puget Sound dirt and sand are endless. Look around you! Life is bursting from every bay and forest. By volunteering with local outdoor organizations, you can witness the miracles of the environment from a new perspective. In the words of Ralph Waldo Emerson, “Live in the sunshine, swim the sea, drink the wild air.” You might be surprised by how happy you’ll feel when you are surrounded by nature instead of walls. Kaiti Dewhirst is a Naturalist with Harbor WildWatch. Her love for Sea Creatures began when she was a small, frizzy headed girl wading in Puget Sound tide pools. A love of science and learning carried her through her years as a homeschool student and in High School at Tacoma Community College. Taking a Marine Biology class in her senior year made her rethink her original plan to go to art school, and she is now pursuing a degree in Environmental Education so she can teach others about being good stewards of the amazing world we live in. After having the opportunity to teach in local elementary schools and participate in public education programs as a HWW intern in Fall 2014, Kaiti is thrilled to continue working with Harbor WildWatch. In her spare time, Kaiti enjoys exploring the outdoors with her family and dog Milli, gardening, playing music, drawing, and learning new things. You might find her in the office on the weekends wearing a squid hat!